Deputy Prime Minister Tan Sri Muhyiddin Yassin delivers his speech during a dialogue with some 400 Malaysians residing in Jakarta, Indonesia. Bernama. JAKARTA: The objective of the newly minted Goods and Services Tax (GST) is not to pay off federal government debts but to improve the country's tax revenue collection system and make it more efficient. 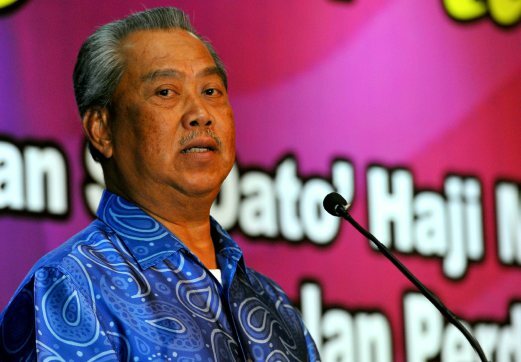 Deputy Prime Minister Tan Sri Muhyiddin Yassin said "paying off government debts" was a narrow perspective. Explaining the demographics of GST, he said Putrajaya saw it as a means to increase tax revenue and trim budgetary deficits. "It is an ideal and efficient tax system, broad-based and more transparent, fair and comprehensive, especially so in the light of the plummeting global oil prices. "Saying that the proceeds from GST will be used to pay off debts is not true," he said last night during a dialogue with some 400 Malaysians residing in the republic's capital. The Deputy Prime Minister is here on a three-day working visit which began yesterday. A participant had asked Muhyiddin why GST was implemented at a time when the cost of living had gone up and the Malaysian ringgit had weakened considerably against the greenback. He went so far as to ask why the allowances of Members of Parliament and cabinet ministers could not be used to pay the GST. "Why burden the people? The salaries of our ministers and allowances of MPs should do the job, especially if GST was implemented with the aim of paying off government debts," he said. The first time this matter was brought up was when Gua Musang MP Tengku Razaleigh Hamzah debated on it during a Parliament sitting last month. He had said Putrajaya must defer its plan to implement GST as Malaysians were not yet able to handle the added strain on their finances. He also said the purpose of GST implementation should not be made a secret. Replying to another question, Muhyiddin said implementing GST was important, as Malaysia could not afford to be left behind, adding that 160 other countries had already introduced GST some time back. Muhyiddin admitted that it would take time for GST to "stabilise", but the "problems we face today will eventually become history once all the glitches have been overcome", adding that it took the United Kingdom one and a half years before the system was stabilised. Earlier, in his speech, Muhyiddin said relations between Indonesia and Malaysia were never better, especially since Malaysia was the first country President Joko Widodo visited after he was elected. "Our relationship will be further improved with the various MoUs and cooperation to be signed between the two nations. "We are 'serumpun' (of the same stock) and our relationship goes back over 50 years," he said. Bilateral trade between Indonesia and Malaysia, according to Indonesia's Central Statistics Agency data, reached US$20.61 billion last year, which was a slight drop from the US$23.98 billion in 2013. With its US$1.86 billion direct investment (FDI), Malaysia is the third biggest investor in Indonesia after Singapore (US$5.8 billion) and Japan (US$2.7 billion).